Spacious and tastefully decorated apartment in Palm Beach, just a minute to the beach. Glass doors out to the terrace (south facing) both from the living room and from the bedroom. In the bedroom you have two single beds that can be pushed together as a double bed. If you need extra bed, the sofa in the living room can be easily converted into a double bed. There is also an additional folding bed. If you arrive by car you may rent a parking place in the garage or use the free parkings in the streets. 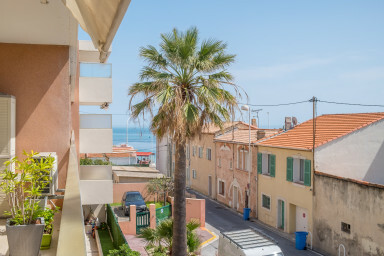 The apartment is located next to the beach in Palm Beach, close to Stade des Hespérides where Jumping international de Cannes horse shows takes place every year in June. Palm Beach has its own little community at the end of the Croisette with shops and restaurants, with beaches on 3 sides of the headland. Public beach just out the door of the apartment with sailing club up the beach. The city centre is only a few minutes away by bus no.8 or a 20 minutes walk along the Croisette. The open-topped bus is perfect to travel along the Croisette, between Palm Beach, the Palais des Festivals and the other end of the Cannes bay. More like a sightseeing tour then an ordinary bus trip. I am very satisfied of the apartment.